Herbal consultations are for people who would like to incorporate herbal preparations into their daily routines to support health. In a herbal consultation we will go over past and current health concerns, including emotional health because it's all connected in holistic healing modalities. We will most likely meet over tea at my dining room table or the screened-in porch or the garden (which in my opinion, is the best place to meet for a healing experience!). My approach to consultations pulls from many different healing modalities, including western herbalism, eastern Chinese and Ayurvedic medicine, and plant spirit healing. These holistic modalities look at the person as a whole, not as separate body systems. I generally suggest foods that will help support your specific constitution or body type, and/or herbal teas, tinctures, baths, soaks, compresses, oils etc. I may also include flower essences which can be helpful for gently balancing emotional states. There may be times it seems appropriate to suggest some lifestyle shifts to create a stage that's helpful for the herbs to work their magic. And we can work up to that point! It doesn't all have to happen at once. People come to a herbal consultation for many different reasons ; they may be disillusioned by modern medical institutions, frustrated they aren't being heard and are rushed through the system, or they heard an herbal success story from a friend and want to learn more about self-care. In any case, people have all sorts of reasons for turning to herbal medicine and my goal is to meet people where they're at, and make suggestions that are easily attainable and provide healing results. I usually meet with people for an initial consultation for a hour and a 1/2 to 2 hours. During the initial meeting we go through the intake form together, I listen to your story and write significant information; this is mostly a time to gather information and orient myself to your story. If there is any herbal remedy I can offer at that moment for an acute situation, I will. After the initial consult we will set a time to meet again, so I can do any more research for your case and prepare a sheet of suggestions for our follow-up meeting. The follow-up meeting will be no longer than an hour to present the suggestions I came up with. Note that herbal remedies are sold separate from the consultation price. It's also important to note that I'm not a doctor. Consultations are not meant to diagnose or treat disease, they are meant to educate people and support health! Initial Consultation - sliding scale $20-$50, for 1 1/2 hrs. - 2hrs. **I offer consultations at a sliding scale, no questions asked. I offer a sliding scale because everyone has different financial situations; the scale helps people who are otherwise restricted from herbal medicine due to costs, have a chance at experiencing it's effects without killing their budgets. I never make that judgement - that is for you to decide; however, if the lowest end of the scale is too much for you, please don't hesitate to contact me (I'm also open to bartering, or trading work helping me with all my herbal tasks!). 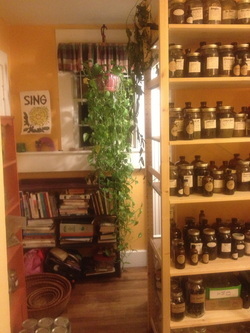 My goal is to make herbal medicine accessible to the most people possible.